As Minneapolis inaugurates the third largest annual Pride Festival in the country this weekend, New York based artist Sharon Hayes is visiting the Twin Cities to launch Revolutionary Love 2: I Am Your Best Fantasy, a public performance that will involve 70-100 local participants coming together to publicly demonstrate the relationship between love and politics during the 2008 Republican National Convention (September 1-4). In the spirit of Stonewall-era gay liberation movements, Hayes plans to intervene at both the Democratic National Convention in Denver, CO, and the Republican National Convention in Minneapolis, MN by instigating readings of texts that address the relationship between political and personal desire, and queer issues, by 75 to 100 people in unison. Blending the techniques of performance art and political rallies, her work addresses the complex historic construction of love and politics. This weekend and throughout the summer Hayes will be recruiting volunteers to take part in the performance this September. Please tell your friends, relatives, gaybours, and anyone this sounds right for – it’s an ambitious project and we need a lot of people to realize it. On one day during the Convention (September 1-4), approximately 70-100 people will speak a text about love, politics, gay power, and gay liberation, written by Hayes for the occasion. We are looking for volunteer performers to recite (as a chorus) a 10–15 minute text, repeated multiple times over a period of approximately two hours. The performance will take place in a public space in proximity to the Convention (Creative Time will send you more details once the site is confirmed). 2. Do you have any additional resources that you would like to bring to the project? 3. Are you affiliated with any organizations that would be interested in spreading the word? 4. Do you have any technical or stage management skills? Attend one rehearsal to practice delivering the spoken text with other performers, to be held approximately 3-4 days before the performance and directed by Hayes. (Note: you will be given a choice of multiple rehearsal dates/times, and asked to attend the one that best fits your schedule. Memorize the 10-15 minute text in advance of the first rehearsal. Agree to be recorded and depicted in video, sound, and photographic documentation of the project (you will be asked to sign an image release form). Sharon Hayes has produced challenging work in performance, video, and installation for over a decade. Staging protests, delivering speeches, and organizing demonstrations, she creates interventions that highlight the friction between collective activities and personal actions. Employing the artistic and academic methodologies of theater, film, anthropology, linguistics, and journalism, Hayes has made work that engages history, politics, and public space. She was an artist in PERFORMA05 and her work has been shown at the New Museum, P.S. 1/MoMA, Art In General, Artists Space, Parlour Projects, Andrew Kreps Gallery, Dance Theater Workshop, Performance Space 122, the Joseph Papp Public Theater, and the WOW Café in NYC. In addition she has shown at the Tate Modern in London, Museum Moderner Kunst and the Generali Foundation in Vienna, at many other national and international exhibition spaces, as well as in 45 lesbian living rooms across the United States. Her collaborative piece, 9 Scripts from a Nation at War, showed in Documenta 12 in Kassel, Germany this past June. For more information on Hayes’ work, please visit www.shaze.info. More information on Hayes’ project and Democracy in America is available at www.creativetime.org/rnc . Revolutionary Love 2: I Am Your Best Fantasy is the second in a two-part project by Hayes taking place at both the Democratic and Republican National Conventions. 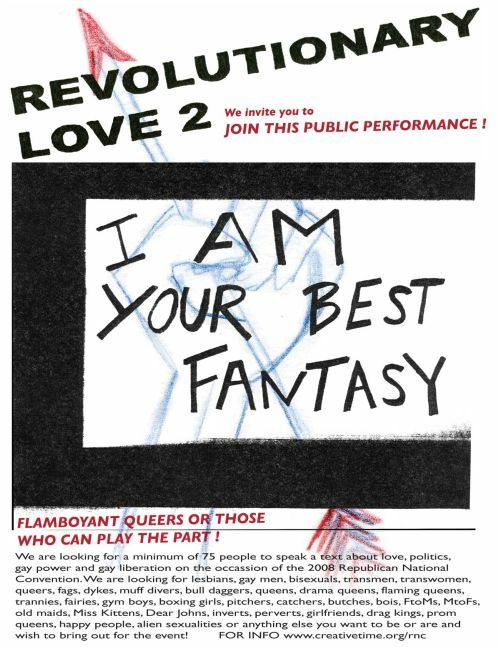 The first performance, which will take place at the DNC, is titled Revolutionary Love 1: I Am Your Worst Fear. Revolutionary Love 2 is presented by Creative Time with the Walker Art Center and the UnConvention as part of Creative Time’s 2008 national public art initiative Democracy in America: The National Campaign.